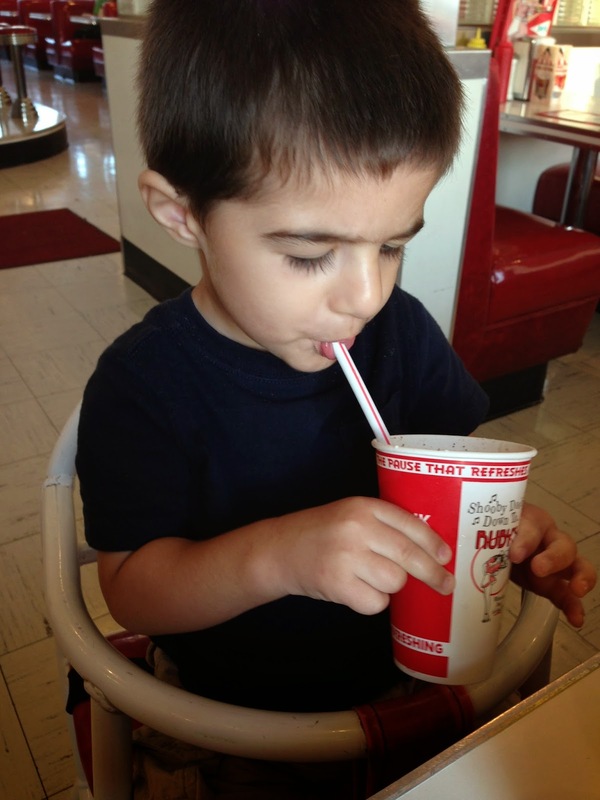 Chasin' Mason: Weekends are for lollipops, cake, and ice cream. I mean, really? Why not. Our weekend started off on Friday with taking Mason to his two year old well visit at the pediatrician. The only reason I say this was part of our weekend is because we both got off work early to go. Poor Mason had been sleeping when Seth picked him up, so the visit to the doctor could have gone better had we not woken him up from his happy place and took him to his most un-favorite place. But, alas, we all survived. The doctor checked him out and (with a little bit of bribing with goldfish to sit still and behave), he was good to go. The doctor gave him a lollipop and he forgot how awful the doctor was for wanting to check his ears, eyes, and all that other fun stuff. The doctor recommended a routine blood test for him to check for anemia, iron levels, and lead so we headed upstairs to go to the lab. Mason must have forgotten what the place looked like from last time (he had another one of these a year ago - they only do them at one and two) because he was happy as a clam until we entered the room where he would get his blood drawn. Immediate meltdown. Seth had the awful duty of holding him down while I had the even more awful duty of watching the whole thing go down. There is nothing worse than being helpless while your baby is hysterically crying and saying "mama mama mama" over and over. 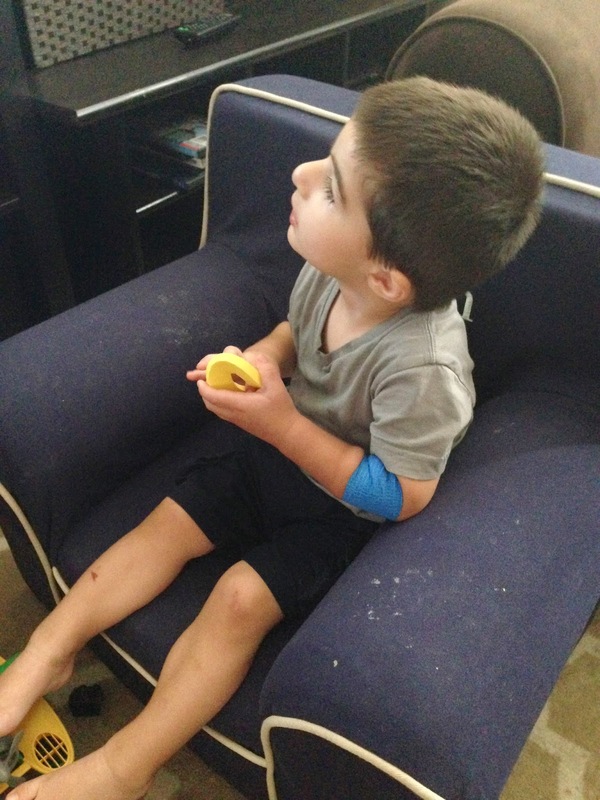 We finally got home after a whole lot of sniffling and Mickey watching in the car and the only thing that would make him feel better was to watch more Mickey Mouse Clubhouse. I can't even handle seeing his little tourniquet. So sad. Saturday was much better for all because we went to the fair. Every year I say I hate the fair and to remind me the next year when I say I want to go that I hate it, but this year I have a confession to make... I didn't hate it! And to be honest, I'm pretty excited about going back next year! Saturday night we celebrated Papa's birthday with a BBQ and pineapple upside down cake. And a make-shift pool with a water slide! I'm not sure that my video on Instagram did it justice, but Mason was having a BLAST. Sunday we had swim lessons, Gymboree, nap time, grocery shopping, and then Mason's two year old pictures. We met my friend Erika, our photographer, in Manhattan Beach and had the best time. The beach wasn't crowded at all, and although it was pretty hot, we got some amazing pictures. I can't wait to see a (hopeful!) sneak peak soon and to hopefully go back to the beach again to play! We ended the night the best way we know how... with ice cream before dinner. In the form of a Ruby's kid sized cookies n cream shake. Yay for the fair! I love the last pic of Mason in the pool. He looks so happy! Glad the weekend improved! I can't wait to see the 2 year old pictures too! His face when sliding into the pool!!!! Priceless!!! Geez! These doc appointments are hard on a momma's heart!!!! Lily had her 2 yr on Friday as well. Thankfully no shots or pokes, but she was fully anticipating them since her Doc Mcstuffins kit contains a "shot". Well checks (especially the ones that require shots or blood draws) are so draining for everyone. I dread them! Luckily, we just had our Four year old well check and his doctor says no more shots until he is 11. Wahoo! (unless something changes of course) Sorry you guys had to go through that. But, the weekend surely redeemed itself for you guys. The Fair? So fun!!! And then topped off with a family BBQ? Nothing better! 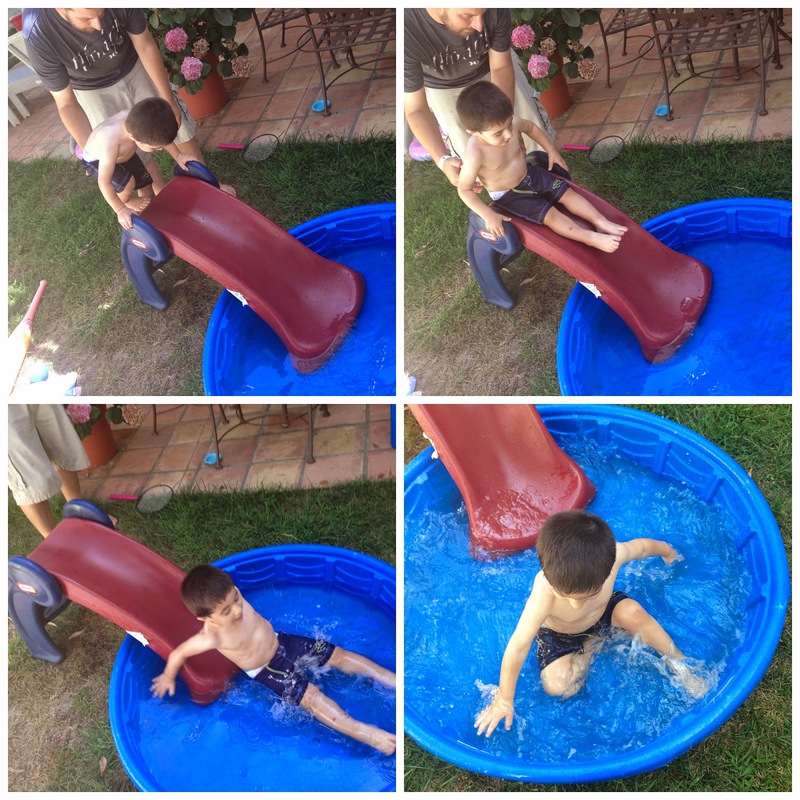 Mason in the pool with the slide – SO adorable! Blood draws are the absolute lamest. Way worse than a shot in my opinion. Wish that wasn't a necessity. We haven't been to a fair in forever, but I hope we can make it this year. I think it comes toward the fall. Glad it was better this year for you! What don't you normally like about it? He looks SO happy in the last pool pic, love it!!! I wish we had a slide so I could make this happen. Dessert first! Your weekends always sound like so much fun! Can I come live with you? :D Seriously though, dr visits are no fun. We skipped the blood test at a year, so I know we have it coming up at the 2 year checkup :( I can't wait to see family pictures! I'm hoping to have some done this fall since we haven't had pictures done since last June. Just came across your blog; needing some new ones to keep up with, along with some motivation to keep up on mine! :) Mason is adorable, but you won my heart with the Emoji instagram, ha ha! So cute. I think it should be a law that you have ice cream before dinner every night. I bet you'd eat less and wouldn't need seconds, Fat America. And I don't want to think of C's two year visit. Luckily, my Mom will be here and you can bet I'll make her go with me. I love him going down the slide into the pool that looks so much fun! I love treats before dinner bc then they arent buzzed up from dessert right before bed :) I think you're a genius mom for doing it! I always make Mark do shots and blood draws. I have to leave the room and he handles it. I just can't watch that. He seems to be getting better at getting over it faster, but I just hate it! Look how happy he was with the water slide :) what a fun weekend!